Everyone should own a Wii U so that they can play Super Mario Maker, it's literally the best game of this generation. 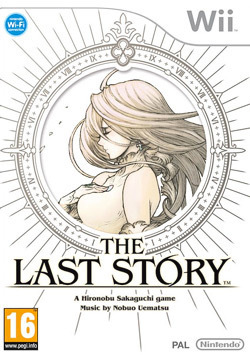 Few games had as much controversy getting released as the Last Story. Fully localized in English for release in Europe, NoA did not see value in publishing it in North America. This was one of the three titles featured in Operation Rainfall which pressured Nintendo in releasing games in North America. Basically, this was a JRPG game coming in a time when JRPGs severely declined in North America. A time different than the revival we see today. It was made by THE JRPG visionary, Hironobu Sakaguchi (creator of Final Fantasy), and probably was thought be Nintendo to be a failed prospect considering its European sales. XSeed ultimately picked up Publishing duties, and it managed to become XSeed's highest selling game, selling twice as many copies in NA than in Japan. "Balancing on the edge of a knife, that's how we lived our lives"
The Last Story, suspiciously similarly named to the Final Fantasy series, is similarly placed in trying to convey a unique story in familiar JRPG setting. Here is where we find the game's strengths and weaknesses in its storytelling. First, the story suffers greatly from the weakness of their central characters. Zael is your typical JRPG hero, and is in the same vain as those other blonde Final fantasy protagonists you feel you have seen a hundred times. Calista might as well be Yuna or whatshername in FF8. So getting into the game, expect to dislike the leads, but don't expect that they will destroy the game's story. That's mainly due to a good supporting cast, that despite conforming to some popular tropes, still manage to be charming. Anyone of them would have been a better Main Character than bloody Zael. In summary, the story follows Zael and a band of mercenaries run by the charismatic Dagran as they attempt to get ahead in life. The world is in constant turmoil, with the dying land causing several factions to fight against each other for resources. They go to Lazulis Island, where it somewhat escaped the scourge of the land. In the background, there is an ancient war with a different species, the Gurak. It's not a unique story, and there are many ways where it could have been better focused. There are cliched one dimensional villains, ancient mysterious powers, and a bland chosen hero. All staples in the JRPG genre. However, the sum is greater than the sum of its part. There are elements that could have been explored better, like Dagran's social climbing, and the true nature of nobility, but it all is done in a good enough way. "If I get killed cos' I'm too hungry and weak to fight, then don't blame me"
Initially, the battle gameplay in The Last Story doesn't seem to have much actual player interaction. You can simply walk around as Zael auto-attacks, and your party decimates the enemy. Occasionally, you can go into 3rd-person view, and shoot some arrows like in a very limited shooter. You will mostly get this impression if you make the mistake of playing in "Normal" mode. Immediately when you start the game, switch to "Manual" mode and never look back. I am not even going to consider "Normal" mode beyond these two paragraphs. In "Manual" mode, you control Zael as you move around the battlefield in real time. You can attack enemies at will, but you have a limited combo and your attack power isn't too much, especially since enemies will guard your attacks once the first combo is over. This means that if you go head on and try to bash an enemy to death, it will be a long time until they actually die. The battle system actually demands more attention from the player. Zael must take cover, try and switch between enemies, chain attacks with his teammates, take advantage of items and magical circles on the ground, and occasionally uses his arrows to shoot down enemy snipers and mages. However, you are not responsible only for dishing out damage yourself. While the friendly AI is pretty good at dishing out some damage, they require your help to be most effective. For instance, the health of each character is divided into 5 health bars, and once one is depleted a "life" is out. Only you can revive them quickly enough, or else they take a while (once all their lives are out they cannot be revived). Mostly, you play the general and the decoy. By attracting enemies towards you, you can free your mages to use their magic and take the pressure from your bruisers. Also, you can specify orders and generally choose what your allies do (in a limited fashion). It can be overwhelming, but the game does an excellent job at introducing new mechanics with short tutorials and a constant pace. Well into the half-point, the game introduces something to shake things up. Boss battles shake things up considerably; rarely are they straightforward affairs. Mostly, each boss have a specific weakness that must be triggered. This requires more direction from Zael, and usually a smart utilization of your powers. Its a unique battle-system that always keeps the player engaged. In may ways, I feel it could be expanded upon and improved, but I like it a lot as it is. Yet, I feel the game's battles never give it its due. There are few enemy types, and rarely is the game challenging enough to warrant a full investigation of how you can best use the system. "Well, well. The human from the castle, blessed with bravery, guts, and stupidity"
I don't think its hyperbole to call Lazulis Island one of the best designed cities in RPG history. Its vibrant streets, busy townsfolk, bustling energy, and all those tight organic hallways, all combine to make a very believable city. Here is, finally, a place where I can believe a hundred thousand people can live. Sure, I only see place for about a thousand or so, but I can also see houses in the background, and what I see here favors the illusion of a bigger city. Walking around the city is going to be a huge deal in the game. The game doesn't have many side-quests (they are actually never tracked), but you will need to walk the streets of Lazulis Island and interact with its citizens to find what few there are. You can also go to market and play as a merchant, or just simply walk around looking for random trinkets. The game rewards you simply for walking around, as you see limitless items that help upgrade your gear. Unfortunately, the same level of care has not been carried over in designing the rest of the game's areas. I am not talking about the lack of other cities, which might be a problem for a few, but about the limited dungeons. In fact, one dungeon repeats itself in a different fashion nearly three times. Sure, they look organic enough, but they are nearly all straight hallways and battle rooms. One exception is in a very cool side-mission set in a haunted mansion. Like other parts of the game, this side-quest could have been much better, but it still showcased a different dungeon design than what we see most of the game. "For the brighter the light, the greater the shadow it casts"
It's obvious that the game tried to tax the Wii to its limits. The Lazulis city-space itself caused some noticeable frame-drops, not to mention in battles where too many things happen at once. I won't give credit for that technical achievement, but I will give credit for that technical achievement actually producing something of note. Graphically, the game's art design is very fantasy focused, but it also showcases the same over-design mentality that plagues Square-Enix. Whatever the hell Dagran looks like, I won't understand. This over-design actually leads to some memorable enemy shapes, as well as some good outfits and motif. In this game, I wasn't overly turned off by it. Characters look good, like an early PS3 game, but with derpier faces (if you allow me to use that word). In fact, they all look good with the exception of Zael (you can tell I don't like the guy). From far away, everything looks great, with the distance filter covering up for all the graphical flaws. Its only when you get close that the muddy graphics start showing the lack of texture detail. As for the game's audio, I cannot complain about the Voice Acting. Since this was first localized in Europe, the English VAs used an all UK cast, and it fits really well with the game's setting. Dagran, Yurick, Syrenne, and Lowell perform admirably. Their jokes don't fall flat, and their banter and dialogue is believable. Mirania's VA doesn't hit those highs. As for the two Main Characters, I cannot blame the VAs as much as I blame the script. I simply think all the awkwardness in their delivery is related to the inherent awkwardness of poorly written cliched dialogue. The soundtrack is another one of those good, if not great, Nobuo Uematsu soundtracks. Aside from the very good main theme, and a couple of great tunes, the game's soundtrack is simply good. It doesn't reach the heights set by Uematsu himself, but it rarely falters either. In many ways, its like the game itself. The Last Story might not be the best JRPG of last generation, ore even the Wii. It might not even be in the conversation of being among the best. Yet, looking at it from afar, you can see that it did have all the elements needed to be among the best, but the final product is a bit lacking. Still, it doesn't go all south, as the game manages to be particularly good in most of its length, and even amazing at times. It is this flirting with greatness that attracted people to fight for it in Operation Rainfall. It was its failure to reach its promise that alienated some of those that fought for it; an anti-hype reaction of you will. Which is a shame, because the end product is still worth the time, and even worth the effort it took to bring it West. 1- Change Battle command to Manual. 2- Seriously follow tip 1. 3- Look around the city for items and stuff. 4- Don't forget to upgrade your equipment. 5- Listen closely while walking around, it might give you hints about some side-quests. 6- Try and get a hang of the Trade Market, its the best source of income. 7- Don't rush into battle, your primary job is to manage your team. I really liked The Last Story despite its flaws. It managed to grab my attention even after all the cringing the beginning hours had me in. I even began to like the cast (except Zael). Its too bad it didn't turn out greater than it was, but it was still good. Next game in the list at #25 is the Wii release of one of the best Rail Shooters around, House of the Dead: Overkill. This won't be be the last Rail Shooter in this list, you can count on that. Oh man. Loved this game. The Soundtrack is amazing .Though I still was irked when I heard those screeches in the Final Battle theme (Title is: The One Who Rules All). Still tho amazing battle music and main themes. My favorite tracks are all of Jirall's themes. Loved the story as well. Grinding isn't as hard and time consuming. Wish JRPG'S would follow this example more often. Less grind more plot. @Lord Awesome wrote: Oh man. Loved this game. The Soundtrack is amazing .Though I still was irked when I heard those screeches in the Final Battle theme (Title is: The One Who Rules All). Still tho amazing battle music and main themes. My favorite tracks are all of Jirall's themes. I hated that final battle music. Uematsu's pedigree is much higher than that nonsense. As for the lack of grinding, that might actually be taken as a negative by some JRPG fans. In Destructoid, I have seen a lot of people that like "healthy grinding", as it encourages them to experiment with the battle system and just relieve some stress. Personally, I think there is a place for both kind of games. But I dislike very grind heavy games. In a time that games were becoming more complex, and every other game seemed to have some RPG elements strewn in, an exact replica of a 20 year old game sounded like a bad idea. Making a Punch-Out!! game that does very little to update the decades old formula could have failed. Yet, it is a testament to the work of Next Level games, and the great quality and originality of the Punch-Out!! formula that it manages to be so entertaining. "Now kid. It's time to show the world that you got what it takes to be a champ"
Like Super Punch-Out before it, Punch-Out Wii is simply a remake of the original NES game. Coached by the ever expanding Doc Louis, Little Mac goes on a quest to get the World Boxing championship belt. Except, this is an obviously disorganized championship. If not, how can you explain the great disparity in Weight classes, illegal moves, and all around ridiculous behavior going in the ring. To get that belt, Little Mac must fight his way through 13 varied characters, of which only one is probably in his weight class. The game is not really about Little Mac though. He is simply a suitable avatar that allows you to face off against the real stars of the show. Each of the 13 characters you face is larger than life. Ranging from the Over-the-top to the ridiculous, these fighters say it all in the way they move, the way they talk, and the way they fight. Glass Joe's prime weakness is obvious from his jittery form and his obvious high guard. It tells you of the shame and tension he must face, having only won once in the ring. Super Macho Man in contrast oozes confidence, with his oily body literally taunting you with his every move. 12 of these characters are simple updates of their NES and SNES versions. Which has great nostalgic value, but its and unfortunate lost opportunity. I say that because the new addition, Disco Kid, is just very well-done, and fits in with the crazy cast with his Disco movements and Disco smile. It makes me want to see more of Next Level's ideas. "It takes two to flamenco baby!" The only update to the Punch-Out gameplay formula is adding two optional control schemes. Both use some form of motion control, and they are not as good as the traditional control method, especially given the degree of precision needed in this game. Basically, you can choose between right and left punches, and you can direct them high or low. To evade opponent's attacks, just pick the appropriate directional input. These are all the limited inputs you need. It's simply not a real boxing game. Its a tactical match, based on identifying opponent tells, anticipating their attack, dancing around them, and going back to punish their opening. In that way, it has the spirit of boxing, if not the mechanics. Matches are designed to be lost, because that's a learning opportunity. You must learn what each enemy vocal and visual cue means, so that you can counter or evade. There isn't really any game like it. More a puzzle game than a fighting game, it still needs split second reflexes and serious memorization to excel. "Hard work pays off kid, and there ain't no harder worker than you"
Since this is more like a puzzle game, each match is more or less permanently solved once you figure out how to beat you opponent. While there are special challenges to prove your mastery, and there is always a better record to break, the game does seem to consist of only 13 fights. Of course, that doesn't mean you are going to finish this quickly. While these 13 fights can technically be completed in under an hour, the average player would probably spend more time getting their face punched out than the other way around. Except, the game doesn't end when you get the championship belt. That's when the second half starts. Each of the 13 fighters now want to get a chance at that belt, and they have trained for it. In Title Defense mode, its the 13 fights again, but an already difficult game just become more difficult. Even Glass Joe himself has a chance to beat you now. It adds another dimension to the characters as well. Their frustration at being beaten against the odds, and how they changed their style to beat you. Glass Joe wears a head guard now, and King Hippo duct tape a manhole cover over his belly button. The game didn't need Title Defense mode, but its inclusion cements it as the best Punch-Out for me. Not only because it increased the length of the game, but because it forced you to re-work how you defeated those fighters before. "Tell your face to leave my fists alone"
Since Next Level Games did not update the mechanics of the game, nor did they add much to it besides Title Defense mode, transferring the game to the Wii was all about the graphics. To showcase the crazy character of the cast, nothing other than the cell-shaded style used in the game could have worked. It allowed the devs to make a cartoonish and highly expressive style that wonderfully translated the NES and SNES sprites into full fledged 3D models. Seriously, the graphics look great on those characters. Obviously, with no need to work on backgrounds, effects, buildings, or really anything but these 13 characters, Next Level Games managed to craft them to the tiniest of details. This also supports the gameplay, since clear visual cues are part of the game. Audio cues are important as well. 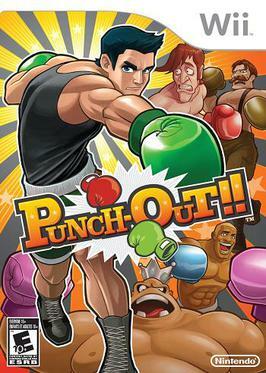 On the Wii, this allowed the devs to have full VA for the boxers. There isn't any dialogue though, they just trash talk, taunt, and express delight at defeating you, or dismay at losing. In an excellent touch, each fighter talks in their native tongue. We might not understand half of what they are saying, but that ads to their crazy character, even if its not as funny as Piston Honda muttering random Japanese cultural items before the fight. Other than the sounds, we get a pretty good soundtrack, with a theme for each fighter. These are all good tunes, updated from the originals and with a little more flourish. Punch-Out!! on the Wii, like Super Punch-Out! !, is not one of the best games in the system. There are games that are more expansive, more varied, and simply larger in scope. Punch-Out is too limited to ever be seriously considered among the best games of the generation. Yet, it does what it does very well, almost perfecting its unique gameplay. In doing that, it is also presenting a great cast of crazy character, in such funny and well realized artistic style. Punch-Out is a game that doesn't aim to be anything but a game, and that is super fine. 1- Observe what your opponent is doing, and learn what each tell means. 2- Sometimes, the enemy repeat their patterns, this means you should prepare a patters to your counters. 3- The most efficient strategy is to counter punch the enemy's attack's, you stop them and get a star point. 4- Star punches are the best way to get a KO. 5- When the opponent is down, mash the 1 and 2 buttons to recover some health. 6- If you get TKOs, you might be able to recover if you mash the 1 and 2 buttons (once per match). 7- Between rounds, press the (-) button to recover some health (once per match). Like with Super Punch-Out! !, I don't think this game will be in my top 10 games for the Wii. Ironically, it might score more than a couple of games in that list in my own rating scale. That's because Punch-Out!! is such a unique series that does what it does to perfection, even if what it does is somewhat limited in scope. Next game, at #20, is a game that is anything but limited in scope, Red Steel 2 tries to use the Motion Control of the Wii to do a hundred things at once. While the original Red Steel game failed because of that, the sequel apparently succeeds. With the launch of the Wii, one of the most obvious possible application of the Wiimote motion was as a method to support more immersive swordplay. Another aspect was the pointing capability which brought us back to the IR shooting cabin days. Ubisoft decided to combine both aspects in making the first Red Steel game. Which, even though it had a lot of promise, have failed miserably as a game. Red Steel 2 is Ubisoft making amends to that initial promise, and succeeding. "Outcast or not, you are still Kusagari"
The game's main catch is its combination of Sword fighting and gunplay, in some way combining the FPS genre with some First Person action as well. It is then fitting that sets place in two asynchronous settings. The Katana comes in from its Japanese Samurai influence, while the revolver is an obvious Wild West trope. In essence ,the game's settings is a marriage of the Edo era Samurai dramas with the Wild West. Anyone familiar with the history of spaghetti westerns would know that this mix fits in very well with that genre. The first spaghetti westerns, such as A Fistful of Dollars, were adaptations of Japanese ronin films such as Yojimbo. Outside of its interesting setting, the game's plot is a rudimentary revenge tale with no narrative power whatsoever. Almost all the characters you meet are reused cliches that are not even able to be cool despite decades worth of material to be inspired by. This is most represented by the player character, the "Swordslinger", who could have been an interesting substitute for the "Man with No Name". Yet, for some reason, the character was not consistent, and is silent most of the game, but speaks enough lines that his silence becomes more jarring and unnatural. Either speak normally or stay silent all the time damn it. "I am going to cut your throat with your own katana. Ain't that poetic"
If you are not interested in motion control combat, or not willing at all to give such gameplay a chance, then this game is simply not for you, regardless of how much you like its other elements. Red Steel 2 makes excellent use of the Wii's motion capabilities, and perhaps crafts as good a game as it can mechanically offer. This means that the game utilizes all the special qualities of motion control, but it does not mean that it removes all of its inherent problems. Let's start with the negatives. First, there are the usual hardware related issues. Sometimes, the Wiimote loses calibration, both for motion control and for IR pointing. It didn't happen frequently here, but it was enough to irritate in such a title requiring constant motion controls. Another issue is related to physical fatigue, specifically when over-committing in the required motions. Both issues do affect your enjoyment, but they are not frequent enough to overshadow what is a unique and engrossing gameplay system. As you can imagine, Swordplay is handled through motions, and gunplay through IR pointing. Because of using motion control, switching from both is natural with your own motions, and mixing and matching can frequently be utilized depending on the situation. Sword play requires specific diagonal moves, but that's not it. Through button combinations, special moves are executed. Through an evade button, the game solves how to move around in a comprehensive fashion. Most of all, you will want to master the combat, simply because it looks cool, and you do feel like a "swordslinger" badass. "It's about time you came to help. I am down to three bullets"
To move the player from one fight to another, the game is divided into two level structures. Some levels act such as an open hubs, with missions guiding the player from on objective to another. Other levels are like mini-linear dungeons, culminating in usually a single objective. All that really does is move the player from point A to B, fighting enemies in the way. Some missions ask you to find or destroy "collectibles" in the game-world, and before it was vogue, some missions consisted of hacking communication towers. It is a weak mission structure, that frankly neither helps nor hinders the game. Since combat is its strongest suite, there is no real reason to provide a litany of objectives just for the sake of it. Battles encourage experimentation to get a better score, which gives in more gold. The gold can be used to upgrade your stuff, which can then be used to kill more enemies and get more gold. It is a basic feedback loop that does the job, and is extra rewarding because of how fun it is to see all that gold literally fly into your pocket. "Good, then we are all safe. I will become a gardener"
In a further step-away from the first Red Steel game, Ubisoft decided to forgo the "realistic" style in favor of a cell-shaded look that manages to give the game a graphic novel look. Seriously, it looks like the characters, enemies, and the entire environment stepped out from some comic book. I already mentioned how the juxtaposition of the Wild West and Samurai setting work thematically. However, that is mostly due to how great they look graphically. Seeing the classic Pagoda roof against dusty canyons is great, especially with how the cell-shading manages to contrast the two. Characters are the same, with unrealistic proportion, but undoubtedly cool designs. So cool, that in the introduction of each new enemy, Ubisoft knowingly introduces them with their meticulously designed 2D Art, and yet you are not disappointed when you see them in the game. As for the VA for these characters, it runs the gambit from somewhat bad, to somewhat decent. A missed opportunity originating from the predictable story and characters, and not the Voice Actors themselves. In sound production, the game offers a thematically suitable sound, with both Japanese and Western influences. A soundtrack combining some Ennio Morricone influence with Masaru Sato's work on Yojimbo, without even approaching their brilliance though. While the soundtrack is thematic, it is too muted, and never prominent enough to stand out. Red Steel 2 is the rare game that could have never conceivably happened in something other than the Wii. By showcasing the freedoms and advantages of motion control, all encompassed in a single attractive package that is actually a game, and not a tech demo, Ubisoft made a good case for Motion Control to still be utilized in mainstream gaming. Unfortunately, despite its critical and user reception, the game has failed to meet its modest target. 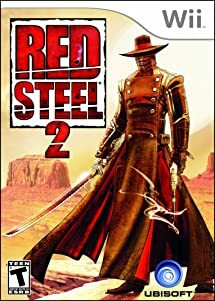 In a way, it was Red Steel 2 that proved how gamers probably don't want to give motion controls a chance, regardless of how good the actual product is. 1- Learn early what position is more comfortable to play at. You will need some space to move your arm, so lying down would not work. 2- Break all boxes you see, it gives you money and its fun. 3- Enemies can guard your attack effectively, so attack from the angle they are not guarding. 4- Guns alone are not an effective tool, so regularly use your melee attacks. 5- Try and do the optional missions, since they do give a lot of cash. Red Steel 2 might be the best actual game to showcase the Wiis Motion Control capabilities and promise, along with Skyward Sword of course. And its failure, despite its brilliance, is proof positive that Motion gaming simply did not catch up with the cor audience. Next game, at #17 is the cute platformer about A Boy and his Blob, which is actually the title of the game. It seems to be another of those cute games that can only be conceived for Nintendo consoles. A Boy and his Blob is exactly the game the Wii was made for. I do not mean a game that was is only possible by using Motion Control, but a game that did not need the extra processing power of the PS360 consoles. A simple, mid-budget game, that manages to look great and play well on a weaker console. Even if a lack of ambition is a little bit detrimental to the final product, as in this case. "One day, an Earth boy came to save Blobalonia"
Apparently, this game is actually a remake of a NES classic. Looking back at that game, I am actually surprised at the mileage the original game manged to get out of the NES. No similar technical effort is attempted this time. As you can gather from the title, the game is about a boy and his blob, which is a sentient blob-like being (hence the name) that can transform into many shapes. There is an overarching story to the game about an evil blob king's attempt to control Blobalonia. However, outside of the game's manual, the opening movie, and one bonus art work, it is never alluded to in the game. That's because the developers made a conscious decision of limiting all story and writing from the game. Simply put, you start the game in the Boy's bed, get introduced to Blob, and finish the game without a single word of instructions or dialogue. Obviously, the developers wanted to build an emotional connection between the boy and his blob. This is the only reason they actually put in a dedicated hug button, at which the boy will hug the blob in a charming and endearing animation. Unfortunately, they do not exactly pull it off, mostly because they never introduce the danger in any effective way. Earlier appearances of the evil blob king would have been effective. That is not to say that the partnership is not charming. Simply, that it is obvious the developers wanted to build a Pixar level connection between the two, and they fell short in that goal. The boy is brave and resourceful, but he is still a 6 year old boy. As such, he has a low jump, cannot fight any small danger, and cannot swim. These are all obstacles the player must puzzle out by the help of blob. Equipped with a bag of infinite jellybeans, the boy can help blob transform into a variety of objects to solve puzzles. These transformations are the core mechanic of the game, and their variety is what sets it out to be a great Puzzle Platformer. Usually, there isn't a single transformation that solves each puzzle. The catch is in figuring out which combination of transformations are needed, and in exactly how to use them. Let us explore a couple of transformations; there are 15 in total. The anvil allows the boy to have a foothold to jump into higher platforms, but it can also squish enemies, as well as serve as platforms to travel on the heads of larger threats. Trampolines and ladders can be used to reach higher ground, but are used in different ways.Then there are the more action focused transformations like the rocket and the hamster ball. Using both changes the game to a higher gear. The regular game consists of 38 levels, each containing 3 treasure chests. Getting the treasure chests require more puzzle solving than simply finishing the game, and once collecting all three, you open up challenge levels. Challenge levels are more difficult, and usually focus on one or two transformations only. Also, they are more fun, as they take more risks with the puzzles, and the extra challenge makes finishing them more rewarding. At the end, the game felt like a slog. Especially since there are simply too many load screens, and they take some time. Once stages become longer, the puzzles seem less fresh, and the originality of the transformations erode. Rarely do I say so, but this is one game that could have benefited from a cut in the number of stages. One thing that cannot be discounted about the game, is how great it looks. WayForward are well respected for their 2D art ability, and it certainly shows here. Not only are the character design cute and endearing, their animation is spot on. The boy's movement are clumsy for instance, exactly how a 6 year old boy would walk. The blob in the other hand is amorphous, yet his transformation all somehow retain the same mass as the original. There there are the excellent backgrounds, which showcase a level of detail that was not possible before. Even in backgrounds that are rarely used. While the same cannot be said of the music, it certainly sounds nice, and it does the job. It is suitably relaxing in the first stages, but escalates in challenge levels, as well as when the boy and his blob travel to more distant locations. WayForward knows how to design a 2D game, and along with their Shantae series, this is one of their best looking games, and one of their best productions. It's easy to criticize A Boy and hid Blob for what it could have done better. There are multiple areas for improvement, especially regarding its narrative (or lack thereof) and how long it felt. Yet, we cannot ignore the fact that it is more than a competent puzzle platformer. It is a charming game, that manages to be smart at times, as well as true challenge. More often than not, it is fun to play, and that's what matters most. 1- Spread out your playing to time to avoid fatigue. 2- You won't always need all the transformations given at a stage. 3- Call Blob three times to summon him if he is far away or behind passable obstacles. In theory, A Boy and His Blob could have been made on any platform. However, it fits right in the Wii's library. Next game to be reviewed is one I actually missed. At #22, Rhythm Heaven Fever is that crazy Nintendo game with all the crazy Rhythm-based mini-games. This would be my first try at the series, and I don't know exactly what to expect. The Silent Hill franchise is one that Konami thought they had figured out, abruptly realized that they didn't, and then subsequently fired in all directions. The fourth game was, in my opinion, unfairly criticized. Apparently, that scared Konami into both changing directions and going doubling down at the same time. After two duds (three if you are unfairly counting Silent Hill 4), few had high hopes for Shattered Memories. Yet, the game managed to defy expectations, and was apparently both a commercial and critical success. Sure, it was a very different game compared to the original Survival Horror games in the series, but it was a good game in the end. For me, I saw why it succeeded, but I also could not look past some of its more glaring flaws. "Whatever ails us, whatever weakness our flesh may suffer under. Our love will cure all ills. Our love will be our rock"
Like with the other Silent Hill games, it is important to note all the details in the story, as the game thrives in being vague, and the player can never be sure what is "reality" and what is not. This game starts with a psychotherapy session, where the world's probably worst psychologist is "analyzing you". The game claims to be analyzing the player, using their profile to influence the game's world according to their fears. Also, this will have a slight effect on which ending "video" the player gets. After that first session, the game starts with a car accident. After that accident, you control Harry Mason, who suddenly realizes his daughter is lost after that accident, and as such begins your goal of finding her. However, nothing is straightforward in the town of Silent Hill. It looks as if everything is engulfed in an eternal blizzard, and the car accident may have disoriented Harry more than he realizes. As you walk through the town and interact with what seems like the only few inhabitants of the town, the game throws narrative curve balls left and right. Between parts of the story, there are more times with the psychologist. The psychoanalysis sessions are important, and they add to the confusion between reality and insanity. You, the player, can never be sure what is real and what is not, and this is exactly the disorienting feeling the game wants to convey. At no moment is Shattered Memories a scary game; there is little to no effective horror elements in it. However, it does attempt to have an atmosphere of consistent creepiness. It mostly succeeds. However, there does seem to be a sense of the game resting on its laurels, and on its atmosphere. While the story is pretty good, and even effectively revealed, it sure seems as if an expert hand is missing in all of this. "You might not like them"
Immediately, if you are hoping for a survival horror Silent Hill, then you shouldn't expect that from Shattered Memories. This is not Survival Horror game at all. There is none of that genre's elements; the game doesn't even have a fail-state. It can be considered an adventure horror game. It can even be considered a precursor to all those "Walking Simulator" games but with more interactivity. The game is divided into two parts. Mostly, you control Harry as you walk around Silent Hill, with no real threat at all. In this "mode", you walk around using the Wii mote top point your flashlight around, solve some minor puzzles, and look for clues. In game, you use a mobile phone as a very effective menu navigation system. You use it to look at recorded clues, check out the map, call numbers you find posted around town, etc. These clues are basically snippets of life in Silent Hill. SMS messages or Voice recordings, showcasing both the mundane and the disturbing parts of Small Town America. As for the other "mode", it is where the game becomes threatening. 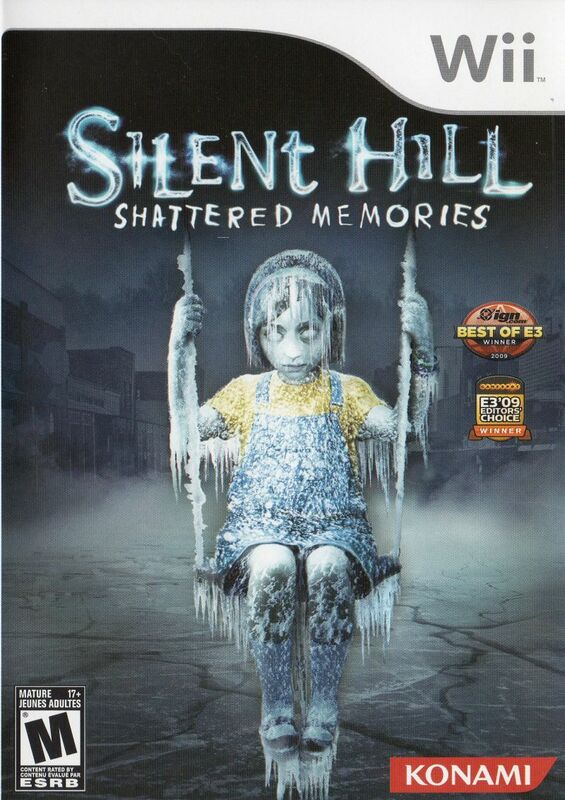 At some points in the story, the world suddenly turns to ice, and Silent Hill releases its nightmares. In this mode, Harry must run to a specific waypoint in a maze like version of the town, running away from the single type enemies (yes, there is only a single enemy type, and no nurses). Here, the game introduces some type of tension, as the player cannot fight against these enemies, but must run away. Both modes compliment each other, as moments of creepy exploration turns into an adrenaline filled chase scene. "Don't beat yourself over it. Blame the world, blame God, blame me!" By designing the game for the Wii, Climax Studios made a conscious decision to utilize the system's inherent capabilities. First, it does that by having the Wii pointer control the game's camera. This works exceptionally well, as the pointing is a natural fit for camera control, and the Wiimote movement simulates the act of actually pointing a flashlight around. As such, exploring the environment becomes a natural movement of the hands, and the tension in controlling the camera while being chased only enhances the experience. Second, the game attempts to utilize the Wiimote's motion capabilities, and that doesn't go as well. There is a variety of little things to do that are annoying but not game breaking, such as rotating the Wiimote to change a dial in a safe, or move stuff around. However, the game does some serious missteps due to the inherent limitations of motion controls. When the conclusion of a game changing event is based on controls that work only half of the time, its not tense, but just plain frustrating. The same is with the "combat" controls during the chase scenes. Theoretically, as enemies grab you, you must jerk the Wiimote in the direction of those enemies to throw them off. Except, that doesn't work all the time. Its simply frustrating when you lose because the controls do not work. Of course, dying doesn't mean anything, which actually makes things worse. Basically, you are required to repeat these chases over and over, cramping you hands and pulling you shoulder, and there is no tension at all. Simply put, the game doesn't control as well as it should be. As a result, its "immersive" gameplay breaks immersion more often than not. "Sshh, no more craziness. You're freaking me out"
While the game falters technically in its controls, it does a great job in in the production department. Silent Hill is at once both a creepy town, and a believable one. An obvious nod to Rust Belt America, this is a dying town that may have once been prosperous because of an abandoned tire factory or something. Now, its a location of nightmares, where snow replaces the fog effect to create a spooky obscure atmosphere. Sure, its there to hide the technical limitations of the Wii, but higher visuals are not what's going to creep you out. Nor are the low resolution assets going to do that either. The game's atmosphere is due to the reality of the place, as it is filled with advertisements, graffiti, and other blemishes that you can actually interact with (any phone number you see you can call). Its presented with solidly built cast of characters, who probably look as good as they can in a Wii game, and their VA is very good as well. While the dialogue can get hammy at time, its mostly solid. The same goes for the soundtrack, which while nothing special, does hold the atmosphere of the game and adds a level to its creepiness. Its not a game that attempts to amp up the scares and jump at you, nor does it try to keep up a high level of tension throughout. Its simply holding a one note of creepiness throughout, that it simply becomes part of the town's fabric. Other than through the technical task in creating the game on the Wii, all while having really minimal loading, Shattered Memories never really impressed me. While the story is pretty good, including an excellent twist at the end, it actually suffers in comparison to the earlier Silent Hill games. In the other hand, the game's dedication to motion controls definitely backfires, and has soured the experience for me just as I get into the story. Still, I can see a good game here. One that could have even been a great game if it has a master's touch. 1- Check your Wiimotes and hope their moton detection isn't faulty. 2- When you walk around and feel the Wiimote vibrating, look around for some clues; the vibration increases as you get closer. 3- Note that what you linger your look at counts towards your profile points, which changes the ending slightly. Actually, I was supposed to go back and play Rhythm Heaven Fever at #22 instead of playing this game. However, I realized that I did not have any Rhythm and as such couldn't continue with what looked to be an excellent game for a niche crowd. Instead, I played Shattered Memories, which went below my expectations given what I heard about it. All the next games in the list, from #15 to #12, I have already played and enjoyed. Which is why I am jumping to #11, the very famous Xenoblade Chronicles. I actually played around 10 hours of that game, but when I lost 5 hours due to not saving the game, I stopped playing. This time, I am going to finish it. Except, I don't know which VA option to use. It's rare that a game comes along and so obviously entrance you in its grip. Not only with addictive busy work (which Xenoblade Chronicles certainly have its share off), but with a consistent sense of joy and wonder. Simply put, I couldn't put away the game until I finished it. That I did not exactly it took 160 hours to do so is a testament to how much I enjoyed the game. "What's born from the Bionis is returned to the Bionis. That's the way of the Homs. " Right off the bat, the game outdoes all other RPGs in it imaginative and unique setting. The opening explains how two titans are locked in everlasting battle that stops at a standstill, with one titan losing an arm and the other barely keeping a massive sword from cleaving right through. From the bodies of those two titans sprang life. In the Bionis, life is biological in nature, and in the Mechonis, it is mostly mechanical. The lifeforms living on those titans continued on their battle, and this is where the game comes in. Millenniums after the titans stood still, the Mechons of the Mechonis laid waste to the various colonies living on the Bionis' battles actually taking place in the aforementioned massive sword. Shulk is the main character of the story, and he is defined through his friends and his ability to hold the Monado, the only sword able to effectively battle the Mechon. Three things contribute to making a great story. First, the setting is exceptionally unique. It first sets in when you go up from the Bionis's calf (where Shulk's home is) into his knee. At the Kneecap, you first catch a glimpse of the Mechonis, staring at the Bionis with what looks like cold rage; his eyes glowing in ominous red glow. It effectively establishes the scale of the two giants, and sets the game in a fantasy world unlike any other. Second, the characters, while they can be considered to be lifted from well-tested archetypes, are executed well. You start the tale with a focus on revenge. However, the characters grow and develop through their long journey, and not even the cute mascot character is denied some development. This is shown more through improving the relationships between your characters and listening in to their Heart-to-Heart conversations. Finally, the story does not stagnate at all and is not afraid of story twists; maybe a tad too many at the end. It has very good villains, especially the wonderfully evil faced Mechon (who add in a lot of personality to their mechanical actions), and the fact things may not be always what they seem. 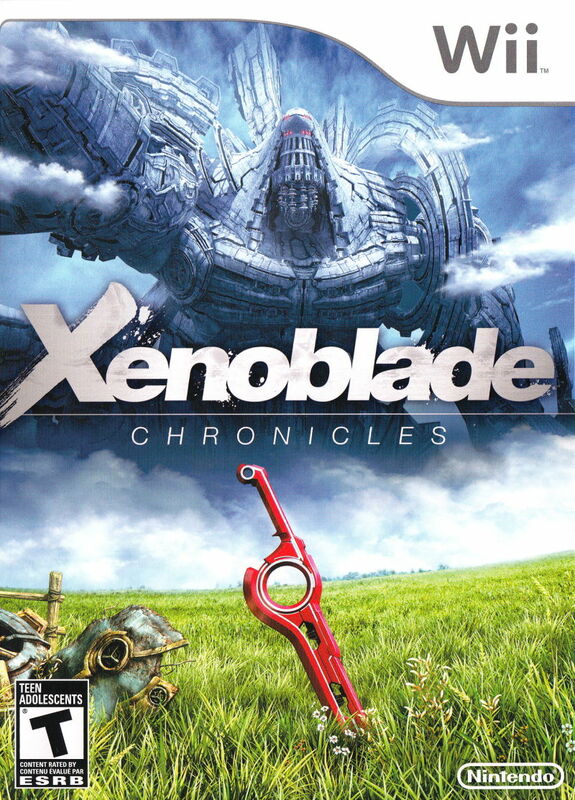 Overall, with an excellent setting, great cast of characters, and strong storytelling under its belt; Xenoblade Chronicles will be forever a memorable experience to those who play it. "It was the Monado. It was.... controlling me"
Xenoblade Chronicles gameplay can be divided into two parts. The combat, and the exploration, and both feed into each other. Fro what I understand, its combat is similar to MMORPGs (which I never played). Basically, you control one member in a party of three and move around your enemies in real time while your party auto attacks. You are engaged in the battle through the utilization of arts, special abilities with a cool down period. Also, you position your character for the best utilization of arts, and occasionally interact with the other two part members. It's incredible how much the combat builds up as you progress through the game. Most obviously, characters join that significantly change your approach to battle. Personally, I would recommend controlling all characters, as they are all fun to play with. However, the system expands near exponentially in some way. Introducing buffs, debuffs, special conditions, auras, visions, special moves, chain attacks, gems, and the bloody kitchen sink with it. Overwhelming, is the adjective I would use if not for the excellent gradual development of the system and the adequate tutorial manual (in game). Outside of battle, to boost your performance you must gear up your party with equipment, gems, and skills. Gems add extra status to your equipment, like extra defense or the ability to regain health on damage. These can be crafted through a system that took too much time from me through the game. Skills on the other hand are gained through natural progression and are nearly unique to each character. The twist is that skills can be shared with other members of the party based on your relationships. It is amazing how the game's various systems bleed into each other, with the affinity gained between your party members adding to their performance in battle, which in turn raises their affinity. With all the various elements involved and the genuine fun of combat, when the challenge level is just right, the battle system can be simply amazing, leading to my biggest criticism regarding the game. The challenge level is rarely just-right. Frequently, it is either way too hard when facing over-leveled enemies, or way to easy when facing under-leveled enemies. If you are in any way a completionist, you will almost always be having an easy time, and the revers is true for those who are only interested in getting forward. A simply difficulty slider could have went a long way in saving this issue. Otherwise, savor those rare battles with right amount of difficulty. "Grieve their departing, and engrave in your heart their brave deeds"
The other major gameplay component of Xenoblade Chronciles is the massive wolrd you are exploring and all the things you can do in it. It is indeed surprising how much there is to see in the Bionis's various body parts. However, wherever you are exploring, it is mostly related to more things to fight, and more loot to get. As with any RPG, there are a number of quests to complete. Here, the majority of quests boil down to fighting enemies, and getting some items. Normally, that would be considered as a unilateral negative in a review. However, if its just an excuse to wander around the excellent world of the Bionis and play around with the combat system; how can it be a negative? Wandering around the Bionis is not always a straightforward endeavor. Sometimes, beasts of unimaginable power patrol the place, and those can kill you in one shot early on. Still, it makes for an excellent return to the same location once you are strong enough to face them. It lends a natural feeling to the world, where Level 90 enemies coexist with Level 10 peons. Note that when you hear the "you are going to die" jig, the only tactic is to run like hell. Not all quests involve combat exclusively. Some quests involve Shulk and co. in the lives of the various communities you visit. That feeds into the Affinity chart system, where named members of the world are all interconnected with one another, and their relationships evolve through your questing. It adds another layer of involvement to the world, and it is fun to see the little map grow like a star constellation. Meaning that whatever you do in the game, it will have some benefit to your performance. "Is that all you've got Monado booooy"
With everything it has going for it, from an amazing world, to a good combat system. It would all fall apart if this vision was not represented well on-screen, and with the Wii's modest capabilities in comparison to its two HD rivals, that was always a real threat. Somehow, Monolithsoft managed to pull of some technical wizardry, because Xenoblade Chronicles is one of the best looking games of its generation. That's mostly do to some superb art direction. In a purely technical basis, there a lot of muddy textures, especially regarding character faces. However, when everything is in motion, you are simply distracted in awe at the amazingly inventive world being presented. I already mentioned the ominous feeling of the Mechonis staring at you in the field. However, that is simply a small taste of how much the world teems with such little details. Everything from a small village in a calf you can see from a distance, to another villageo on the palm of a giant's hand. Rock formations are impeccably designed, and when the night comes in some locations, the entire area sings with life. That carries on to the design of the inhabitants, especially the mechon who are as elegant as menacing in their form. One negative I observed is the choice of costumes for your characters (changes based on Armor), which is in the ugly side, especially for Shulk. Of course, an excellent soundtrack and sound design is there to support it. Gaur field is frequently cited as one of the best songs of the game, but that is a difficult one to choose when there are so much excellent choices. Satoral Marshes at night is an amazing track, and so is Valak Mountain. Also, I could choose one of the more dramatic tracks that effectively convey a sense of danger or foreboding. Or, maybe a battle track that keeps you pumping into action. Whatever your choice is, this is one of those RPGs that you will come back to its soundtrack years later. Finally, lets spare some thought to the game Voice Acting. One positive from the start is the ability to choose between the English version, or the Japanese Original. I alternated between both to test things out. In my opinion, the Japanese version of Dunban doesn't sound too good (not that I can understand, but the voice doesn't fit somehow). Fiora's VA in both English and Japanese has some pros and cons. However, Riki's English dub is all kinds of terrible. Every one else is purely a matter of minding the English accents or not. Personally, I think outside of the repetitive battle chants, they do a pretty good job. When Xenoblade Chronicles was released in Europe but not in North America, fans of Nintendo combined with such great numbers to convince Nintendo to change their mind. Little did they know that they were fighting not only for one of the best RPGs of the generation, but to one of the Wii's best. Simply put, Xenoblade Chronicles is a great game. One that if anything, will at least influence the art direction of countless games in the future. Already, games like Bioware's Anthem are clearly inspired by what the Xenoblade team did in Chronicles and Chronicles X. Outside of that its simply a great game in its own right. From setting to sound, it hits it all out of the park. Almost like if the batter could see the future of each pitch. 1- If you are looking for a rare drop fro a monster, then save BEFORE opening the chest. Open, and if you don't get what you want, load. Rinse and repeat. 2- Some monsters have spike effect that can cause you harm when attacking them. Two ways of dealing with it is equipping some preventive items and gems, or killing their Aura. 3- Take the time to smell the roses and do some quests. 4- Whenever you go to a new area, get all quests so that you don't have to double dip in the game. 5- To increase affinity between your party members, have them be in the same party, or just exchange gifts. 6- Talking to named characters at different times can yield different quests and some new affinity changes. Typically, the times are in multiples of 3. 7- Try and use all characters, its fun to play around with all of them. 8- Always keep weapons that can damaged the Mechon, if you have much stronger weapons. I am so glad I went back and played this game now. I waited for it for a long time when it was first released, but I stopped playing it when I lost around 6 hours of gameplay. Now, I cam back to it for the express purpose of reviewing it as part of this review series, and I do not regret it at all. Next game in the series is an innovative little treasure. Aptly named, Little King Story which sits at #7 in the Gamesradar list. Its basically a juxtaposition of genres together in a package that became a cult hit. I think this is one game I would either dig, or not get at all. Publisher: Rising Star Games, Xseed Games, Marvelous Entertainment. Little King's Story was an unassuming release in the Wii's library that caught the few who played it by surprise. What was a quirky and childish-looking strategy game turned out to be a diabolical masterpiece. At so many levels, Little King's Story is a perfect example of the best games on the Wii. Something unique and innovative while having unmistakable depth. There is no two ways about it, this is one of the generation's best games. One which is in no way perfect, but is more iconic due to its imperfections in an otherwise wholly unique package. "I am more noble than you, he is more noble than me. The rich are more noble than the poor. The hard working are more noble than the lazy. Then who is the most noble of them all?" From the first notes of music, when you hear Ravel's distinctive Bolero notes, you realize that this game is either making a big show of things, or it truly is going to deliver something interesting and unique. You control the King of Alpoko, a child who wandered into a mythical kingdom and became its king. As the king, the head honcho, you become responsible for building up your kingdom, by of course, going to war. Supported by a bunch of self-serving advisors, you are pushed to go an conquer the other domains from both nature and other kings, and of course, save some princess (who all become your wives). It is clear that nothing is what seems in the surface, and that the game tackles a variety of topics with both a satirical and wondrous eye. No two people would agree on the underlining symbolism in the game, and that's what makes it great. Little King's Story is a game rife with symbolism, but at no point does it beat you in the head with a "right" answer. Instead, you are just living the game, sharing the wonder your child protagonist must feel, and at the very least enjoying the hilarious parts of the story. From interactions with the supporting cast and the conquered kings, to your conversations with the any citizens that form both your army and government, there is always something either funny or thought provoking to read. The gibberish language only adding to the style and the childish lens. "One fine morning in the Kingdom of Alpoko, a tattered flag raised above a ruined castle fluttered the wind"
Regardless of how good the story and wondrous setting of the game is, it wouldn't work without some equally good gameplay. Thankfully, Little King's Story provides something that is both satisfying and challenging. If I am going to explain the gameply, I would say the closest to it would be Nintendo's Pikmin games. Like with Pikmin, you control a central character that controls an army of sorts. Initially starting with just the ability to control five citizens, the king can then control up to 30 of them. Like with Pikmin, the crux of the game-play is in maneuvering with your army and then throwing them at obstacles and enemies. The strategy is in organizing an army with different jobs and utilizing them well. Each job is useful in one-way or another, from typical soldier to carpenters and miners. One job is only useful for efficiently cooking chicken (which is much more useful than its sounds). Generally, battles are an exercise of switching jobs, sending citizens at the enemy, changing formations, and frantically avoiding attacks. It can be extremely chaotic if you don't understand what you are doing, but is actually well-controlled if you take the time to understand the system. That is something I strongly recommend that you do, because the game can be deceptively challenging . You find yourself building relationships with your citizens, and when some strong enemy starts massacring them, you will lose your calm, as their cries of death blame their fate on you poor command. Most of the time, defeat is due to the player's own lack of preparation or competence. However, the game sometimes seems very cheap in introducing insta-kill moves, which if you didn't know about will surely know when you see half your army go to the four bloody winds with one swipe; forever disappearing from your town. Other times is when the game's control scheme loses focus. I don't know if the fault is in my own Wii set-up r the game's, but there has been frequent instances where the game didn't control accurately enough. Sometimes, one button press would register as two, and instead of changing to my soldiers I would fling some poor kids at a dragon. Saving often, and avoiding doing much before crucial battles is important to keep your calm. With bosses, dying will give you the ability to restart the entire fight with all of your army intact. This means the problem is still there, but is at least with a lesser impact. "Having sought the true king for 35 years, I am getting a bit emotional and teary-eyed"
Outside of the first few hours, the game gives you little direction of how to spend each day, and basically leaves you at your own leisure about how to go and conquer the world. The main gameplay loop is to go explore the world, collect some loot, do some quests, and spend all that money upgrading your kingdom. Upgrading the kingdom gives you more citizens to control, more equipment to give your army, better health, and more jobs to choose from. You then take those upgraded citizens and do the same thing all over again. It is an effective system that always gives you a sense of progress, culminating in one of some brilliant boss battles. And so, with each passing day, you see how the Kingdom of Alpoko expands, and you see how your citizens react to your orders. One Jumping Jacks decree (which raises the max health of each citizen) will see some of the citizens practicing it while you walk around. That sense of having fun just walking about is all what the game itself is about. As you rescue more princesses, they give you special tasks. One princess asks you to collect the tunes your citizens hum at night. These are badly sung renditions of classical thees such as Beethoven' 9th or the Moonlight Sonata. In itself, it is a weird sidequest. The fact that once you uncover one person humming the song, you then see others who learned it humming it is what makes it so fun. I had an evening with my mum, getting her to try and guess these badly hummed songs are renditions of which classical music pieces. "Princess Apricot is so kind. She let me lick it the other day..."
Being on the Wii, Little King's Story is not exactly a graphical marvel. However, even with the Wii's standards, the game looks worse than counterparts such as the Pikmin series. What it lacks in graphical power, it makes up for with stylistic choices though. Starting with the "cut-scenes", which are are designed like some moving water color painting with animated brush strokes, to the super deformed chibi-looking king and citizens. This is a game that has a lot of personality in its colorful choice of graphics, and that works more often than note. Even in the middle of the most chaotic of battles, you can recognize what each of your citizens is doing from the distinctive shapes of their hats and the equipment you game them. If someone is equipped with a pillow weapon, they will be carrying a pillow to battle. The true star of the art production department is the soundtrack though. With a remix of classical themes from Beethoven, Mozart, Brahms and even more modern classical artists like Dvorak and Gershwin, this is of course going to be an excellent soundtrack. However, this doesn't mean that the soundtrack rests on the brilliance of its free source material. No, these themes and melodies are expertly remixed into shorter versions, and the sound direction is impeccable in how they are used. More importantly, the game doesn't lean on the more well-known tracks, and actually gives an effort in exploring a wide repertoire of classical music, showing a love and respect for the source material that carries obviously into the game itself. It is not easy to review a game like this. If you take all the parts, you will write a review suggesting that each part is really really good. However, it is actually difficult to explain how the final result is even greater than the sum of its parts. 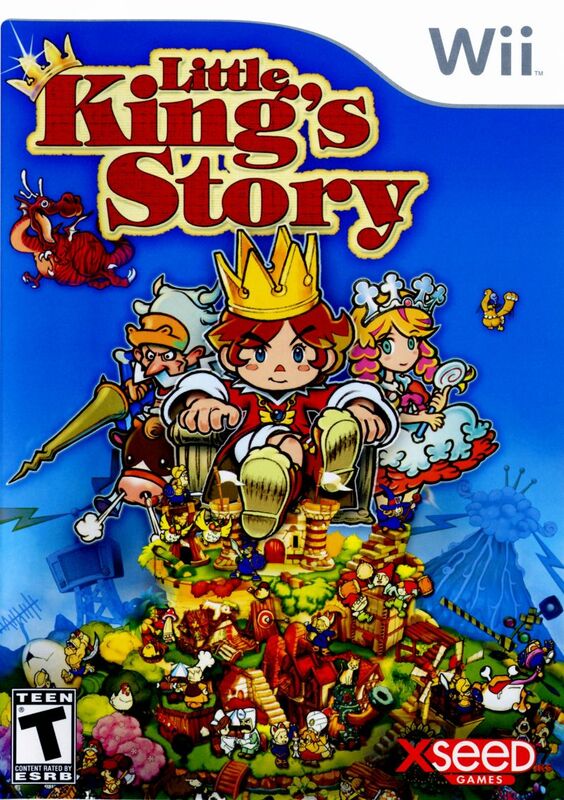 The best I can say is that Little King's Story was a criminally underappreciated game, one which had all the elements of being a classic, buried deep into an unassuming package that many glossed over. Hope we don't make such a mistake again with another gem like it. 1- Always carry a farmer with you to boss battles. 2- For boss battles, Soldiers and Hunters should be the majority of your troops. 3- When simply exploring, get at least one of each non-fighting job. 4- You can produce children by throwing your army int church and getting them married. 5- Children can climb trees. 6- If too much of your citizens die, they won't come back. 7- Dragon enemies (and enemies carrying dragon tails) can one-kill your citizens. 8- Frogs can insta-kill as well. That was another great Wii exclusive, one that was completely ignored by the 100 Million Wii owners, many which complained about the console collecting dust while a masterpiece was in front of their eyes. Life can be unfair sometimes. Next game to be reviewed is another ignored title, the first No More Heroes game. The second No More Heroes game sits at #5 in Gamesradar list, but I am reviewing the first game before it. This is one game that I apparently should not play in the living room of the house. Game: No More Heroes 2. Game: Sin & Punishment: Star Successor. Genre: Rail Shooter, Bullet Hell. A sequel to the cult classic Nintendo 64 game, Sin & Punishment: Star Successor is exactly the type of game the Wii was made for. A laser-focused mid-budget game that takes advantage of the Wii's biggest strengths without falling for any gimmicks that detract from the experience. For fans of the Bullet Hell genre, this game is pure bliss. For everyone else, you wouldn't probably appreciate the great depth and brilliance of the game's mechanics, but there is enough action for you to be satisfied. "Your allegiance to that monster will threaten the entire universe!" Maybe fans of the first game would understand more of the cryptic story since few of it is explained in this sequel. Ostensibly, this is a game about two characters, Isa and Kachi, escaping from the murderous clutches of the "Creators". The game doesn't tell you much, other than the fact that Isa was originally supposed to capture Kachi, and is now aiding her escape. The setting of the game is a post-apocalyptic Earth, where mechanoid bio-creatures have evolved as an immune system against everything threatening the planet, including the two main characters. True to an arcade game of this type, the story doesn't matter much, but lacking a narrative motivation is a bummer. Especially when research on the backstory of the game reveals many details that could work to craft an interesting story. With the limited narrative, the world and character design are left to do the heavy lifting, and it's interesting enough to work, even if a proper narrative would have been appreciated. "Hand over the girl. Act swiftly and I might just spare your life"
Obviously, for a game of this type, it lives and dies by its gameplay. Although it offers several control schemes, the main one is undoubtedly the Wiimote and Nunchuck. Using the Wiimote to accurately aim and the analog stick to move your character, the game is a mixture of Rail Shooters and Bullet Hells SHMUPS. As you move on-rail from encounter to encounter, you are faced with an impressive variety of enemies and bosses that are trying to kill you. To fight back, you have a basic array of abilities with a lot of utility. First, there is basic shooting with an additional ability to lock-on targets. Adding to that, there is a powerful charge shot that can be unleashed after a cool-down. Then there is a melee combo that can be used against enemies that get physically close to your avatar. As for movement and evasion options, you can move all over the screen to avoid enemy attacks, but can also phantom dash through attacks. Though, you need to pay attention not to dash into an attack. So far, Star Successor is not offering anything different. However, one more ability that you have is to deflect some special shots (bombs, rockets, energy balls) right back at your enemies. That introduces an element where you need to make the decision between dodging an attack or the higher risk option of taking it head-on and kicking it back into the face of your enemies. All these elements combine to create a frantic, chaotic, but very deep and precise gaming experience. This experience is focused not on narrative brilliance or even novelty, but rather on the mastering of the game's mechanics and increasing your high score. This is why the game is immensely replayable. "Leaving so soon. There is no escape from the Nebulox"
Fans of the main developer of the game, Treasure, will be familiar with their modus operandi. Basically, their games are famous for having several unique and exciting bosses per level. As in, five bosses per level easily. These provide the highwater moments of both excitement and difficulty. They will require you to recognize their patterns, evade seemingly unavoidable attacks, and whittle down and impressive health bar. It is usually at these moments where many will see the game over screen and become familiar with its chime. Getting several game overs will not affect your ability to finish the game, as the checkpoints make sense and can allow you to progress despite dying several times. However, they do reset your score and score multiplier, essentially landing a good hit to your ego. Frankly, that scoreline is not cosmetic only, or in any way the sole domain of experts. Finishing a level without dying is what you should strive for, as it is evidence of understanding the game's systems and utilizing them well. That's easier said than done however, as the later stage's enemies and bosses ramp up the difficulty significantly. In my first Normal difficulty run, I died at nearly every checkpoint in the last two or three levels. Only after finishing the game again at Easy was I able to get he chance to fully understand the game, at which point I mostly managed to finish each level on Normal without dying (but still being hit a lot which affected my final score). While this difficulty and ego bruising may be off-putting to some, it only serves as an extra motivator to those who are willing to put in the time and practice to perfect the game. "Hey!! Where is my Alien donkey?" Being on the Wii, Star Successor naturally misses the extra detail present in the HD consoles of the time. This is obvious in the muddy textures and washed-up graphics that are prevalent in the entire games. Note that the bullets, missiles, and attacks you need to avoid are all very distinct and clear. To compensate for its graphical weaknesses, the game's art direction tries to focus on the creature and location design, which looks foreboding and cool. In motion, you can easily ignore the shortcomings of the Wii and instead appreciate the sheer creativity in movement. This is made easier thanks to the explosions of sound an color that comes with the action. Sound effects are top notch, and that's only supported by a good soundtrack with some excellent music. Every time I hear the opening riff of the boss tune, I sit in attention to prepare for a grueling but exciting battle. Although, that familiarity with the tune may suggest that it is used too often. Finally, the voice acting is decent, with the ability to choose the original Japanese VA if you prefer. I sincerely believe that everyone who tries Star Successor and attempts to learn its intricacies and quirks will come to very much like the game, despite the difficulty and Wii-related limitations. That's the case for the majority of people. Yet, for the minority who are fans of the genre, and are willing to truly go into the depths of the game at all its difficulty levels, they will absolutely love the game. 1- I suggest to play your first playthrough on easy mode and increase the difficulty in the subsequent runs. 2- Your hitbox is in the middle of the character's torso, meaning that shots in the legs and even the face wouldn't count. 3- Make sure to practice deflecting bombs and rockets, as that is a very efficient way of dealing with threats. 4- If you want to target something specifically with a deflected shot, make sure they are locked-on. 5- To get extra points, try to stay in the ground as much as possible. 6- Pay attention to the color coding in the game, which suggest which attacks you can counter and which have homing abilities or extra effects. With this game, I have played almost all of the games on GamesRadar Top 50 Wii games (which now inexplicably became a top 25 list). The final games on the list, numbers four, three, two and one are all games I already played before so I am not reviewing them again. They are: Kirby's Epic Yarn, Super Smash Bros. Brawl, The Legend of Zelda: Skyward Sword, and Super Mario Galaxy. This doesn't mean I am done with my Wii reviews yet (although I am close to doing that). I am going to review two or three other little known Wii games, starting with Phanton Brave, a little known SRPG that was also released on the PS2.